The Department of Comparative Humanities is a community of scholars who study and teach the broad spectrum of the global humanities traditions, exploring cultures, religions, literatures and languages across a variety of media, geographic areas and historical periods. Our expertise spans the globe -- from the Americas, the Caribbean and Europe, to Africa, the Middle East, and South and Southeast Asia -- and, in historical and theoretical terms, extends from late antiquity to modern and contemporary times. Our mission is to broaden the scope of the traditional humanities by examining the historical and contemporary diversity of the humanities across the globe in various ways: expanding the range of scholarly knowledge in western and non-western areas and critically interrogating the discourses in which they are expressed. The Department offers a distinctive humanities model, collectively creating a comparative humanities learning experience for our students by faculty grounded in specific disciplines (film, history, religion, linguistics, literature). 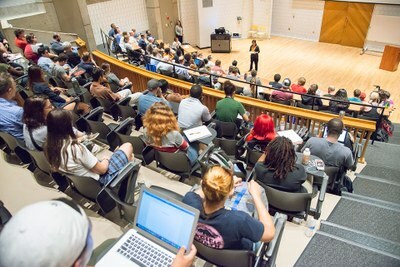 The Department of Comparative Humanities offers students integrated, interdisciplinary learning experiences in a flexible curriculum combining historical and theoretical approaches with textual and critical methodologies. Our students compare, analyze and integrate critical and creative approaches to our globalized world.